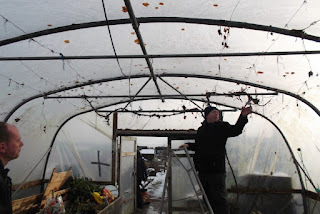 Well, another year nearly over and to celebrate, last Wednesday we held a pre-Christmas fuddle in the polytunnel. There were about a dozen of us volunteers in total. Thanks to all those who brought delicious food and drink for us all to enjoy. A thank you also goes to Helen for capturing the event on camera and for her brilliant 'Christmas tree' wigwam design. Overall, we have had a good year at Dig In. 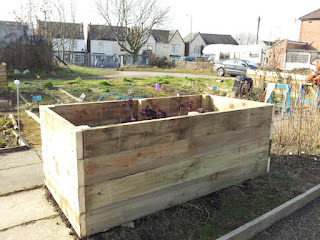 The weather was certainly an improvement on 2012 and our programme of structural improvements on the allotment continues with the replacement of edging timbers around the beds, a new storage shed and a porch canopy for the eco-loo entrance. A special thanks to Alan Withington (RCAN) and the hard working volunteers from DISO. Sadly, Lauren, our session worker left this year to do more work with schools, but Dig In is now pleased to announce the appointment of Karen Fry as Lauren's replacement. Through secured funding, Karen will be continuing Lauren's good work in leading most of the Wednesday volunteer sessions next year as well as numerous Saturday sessions. Local outreach will schools and other groups will also continue, again under Karen's leadership. With a background in art and design, Dig In are also pleased to announce that Joyce Killowe will also be joining us to lead several Saturday workshops in 2014 and also to act as stand in for Karen. On behalf of the management committee, we are looking forward to making 2014 our best year yet and wish everyone a very Merry Christmas & Happy New Year. 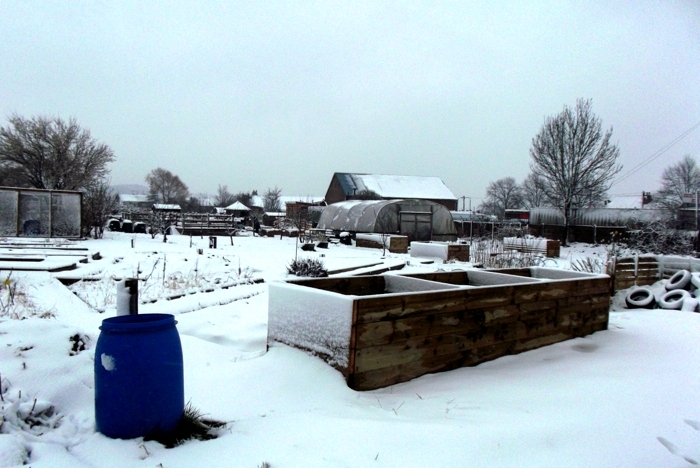 If you fancy losing a few pounds in the new year after the Christmas excesses, why not come along to help out on the allotment? We're open every Weds & Sat 10-12, just press the doorbell at the site gate to be let in, or drop us an email to let us know you're coming if you prefer. Newcomers always welcome, no experience necessary. First session of the new year is Sat 4th Jan.
On behalf of DIG IN Community Allotment, I'd like to thank you for your continual support, hard work and creativity in keeping DIG IN doing the great work it does. Volunteers continue to be the backbone of the project, without whom DIG IN wouldnt exist. 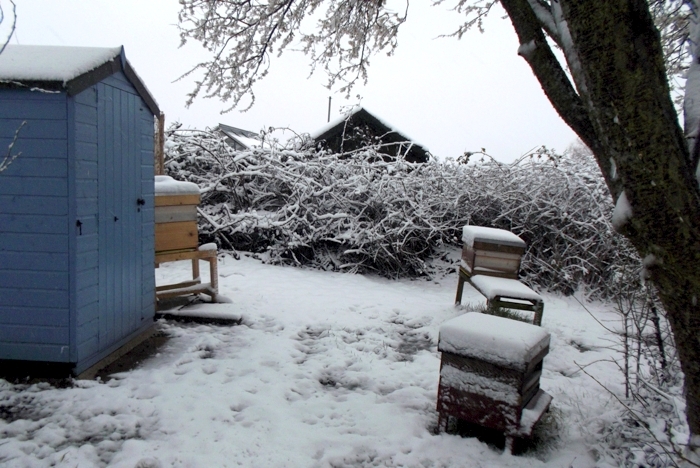 We look forward to 2014 with renewed vigour, a new shed and a lovely loo- and hope that your precious time will continue to be shared with us. 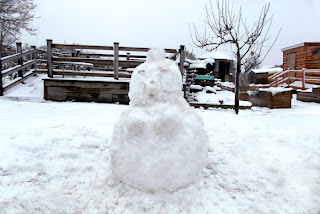 Happy Christmas and a green New Year! Dig In held its first Harvest Celebration last Saturday. Despite a cool and damp day weatherwise there was plenty going on to keep all ages entertained. The rain wasn't a problem as the pumpkin carving took place in Tracey's tent, the glass painting under a gazebo, the face painting in another gazebo and the most popular area with all ages was the polytunnel where there was plenty of harvest home baking to be enjoyed. The homemade soups were very popular and the Bombay potatoes really warmed things up! Pumpkin based cosmetics were on offer along with chutneys and recipe books for those with culinary interests. Mary made very tasty apple pancakes and the apple press was in demand all day providing a constant stream of pure apple juice - fantastic! Those wondering what variety of apple tree to plant in their garden were treated to a huge selection of different apples to sample to aid their selection process. Great prizes were won on the Tombola and everyone seemed to enjoy their Harvest day with pumpkin works of art being gingerly carried home by the children artists. The weather might try, but it never spoils a Dig In event! Thanks to all those who came to make the event such a success. In total, we had 72 people, comprising 37 adults and 35 children, plus our team of hardy volunteers who made it all possible. See more event photos on our Facebook page. Here is a photo of one of the new Dig In banners. This one will be displayed on the fencing adjacent to the main site entrance to encourage more volunteers to join our happy band. We also have another banner specifically for events. Dig In welcome volunteers of any gardening ability and experience. All tools, materials and equipment provided and there's plenty to do on site from general weeding to planting and harvesting. A special thank you to Kathy for arranging the banner printing and Helen for the photo. Although summer is still in our thoughts and we are enjoying the sunshine and warmth our thoughts are turning to preparing for the autumn. We all need a bit of help to get through the winter months and insects are no exception. 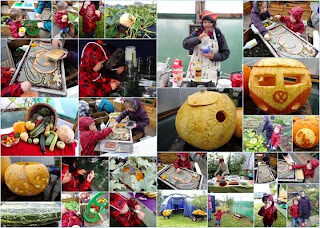 Following on from our fabulous pond dipping and bug hunting workshops, DIG IN community allotment will be running a free workshop making bug houses and hibernation boxes for insects. Fun and interest for all the family, come along and discover how best to support our wonderful insects through the winter months and what you can do to help. Make an insect hibernation box to take home and place in your own garden. 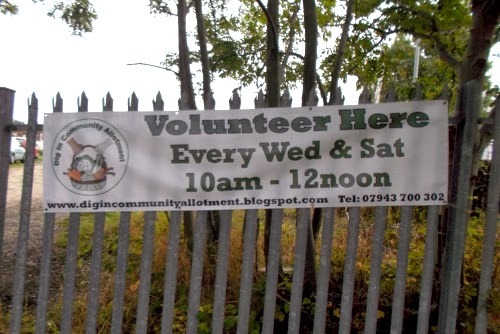 If this is your first time at the Dig In site , you will have the opportunity to meet some of the local volunteers and take a stroll around DIG IN community allotments lovely site. Come and learn more about DIG IN and have fun making an insect box. All children must be accompanied by an adult, numbers are limited so please use the contact details below to book or for more information on how to volunteer or just enjoy DIG IN. One of the crops on site that is really enjoying all the sunshine and rain is callaloo. We first grew this last year as part of the Sowing New Seeds project. It didn't do too well last year - not surprising as it is a Caribbean vegetable that likes the heat! This year it has set itself all over the garden like a weed! For more information check out the Sowing New Seeds web site. It can be used much like spinach, but for an authentic taste of the Caribbean - here is a link to a traditional Jamaican recipe. http://eatjamaican.com/recipes/Jamaican-steamed-callaloo.html So start experimenting and enjoy! 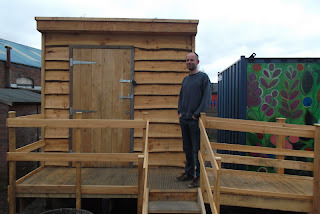 Since the project's conception, the absence of a toilet on the allotment has left many a poor volunteer and visitor cross-legged and running to the nearby pub to use their facilities. 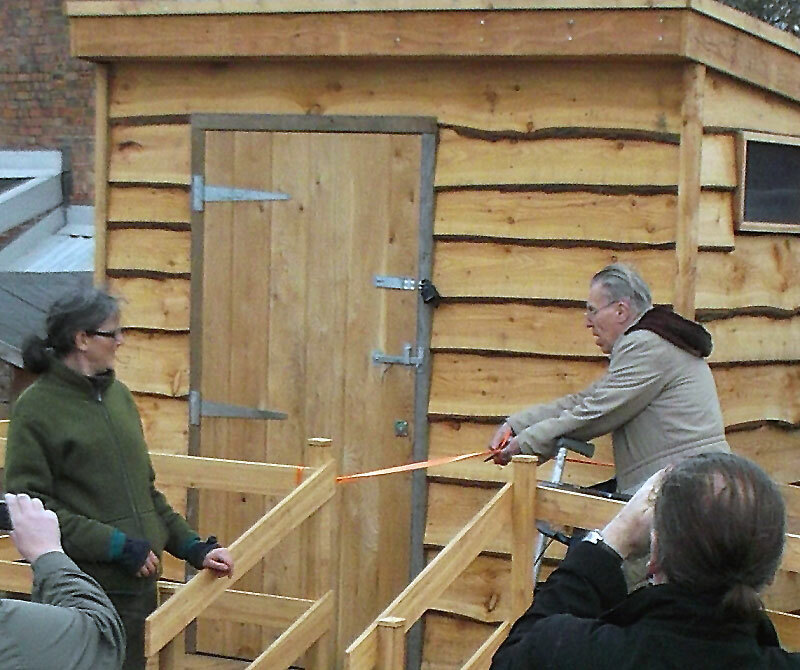 After several years of discussion and planning, we are now delighted to announce that this Wednesday saw the official opening of the Dig In Eco-loo. 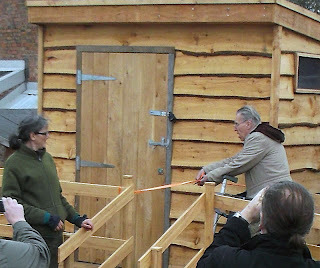 Following an opening speech by Lauren, Roy tested and approved the disabled access ramp, also doing us the honour of cutting the ribbon. Tim (the builder of the facility along with James) also dropped in for a visit and Jill, Claire and Helen made some fabulous cakes and tasty snacks to round off the event. A special thanks to our wonderful and generous benefactor who provided the funding for the build from a legacy left by his father and to Stapleford Town Council/Broxtowe Borough Council for all their help with the planning permission. 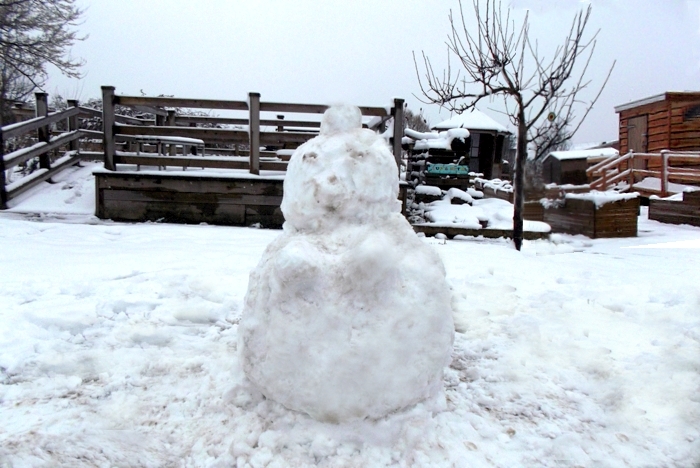 Although officially cancelled due to bad weather, three of us did turn out for the volunteer yesterday. 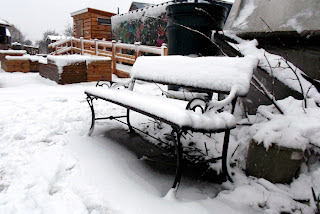 Not much could be done outside, but we did manage to disinfect some of the empty plant pots in the polytunnel. It was also our first opportunity to inspect the new perennial weeds container which was constructed by Alan Withington and a team of volunteers from the University. I have to say they have made a first class job and we look forward to filling it with our couch grass and other nasties as we dig and weed the beds in the coming months. "The following pictures are from our recent Building Spaces For Growing workshop, which was held on 28th February 2013. It was run by Alan Withington. The weather was superb and we all learned a lot. Looking forward to the next one, which will cover smaller planters, bee boxes and trellis fencing. Details will be here on the Blog and our Facebook page." The positioning of the original compost store meant that deliveries of manure could not be directly transferred from a trailer into the storage bay, so this new design should save us a lot of manual work. 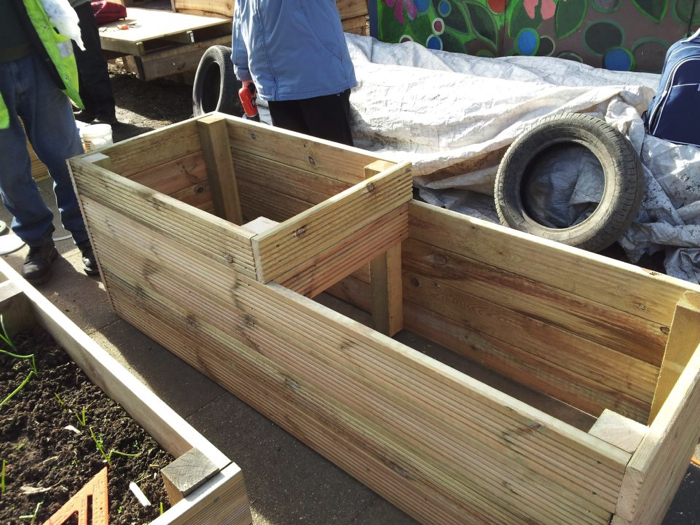 Several of the original raised beds were also in various stages of decay, so needed replacement and two new beds were created for future use with other community groups who will visit the site. Many thanks go to Alan Withington with support from RCAN and the Grow and Grow project. Many Dig In volunteers will already know Jill Carter of Pulp Friction fame. Jill has assisted in many of our events with the catering and running a Smoothie Bar. 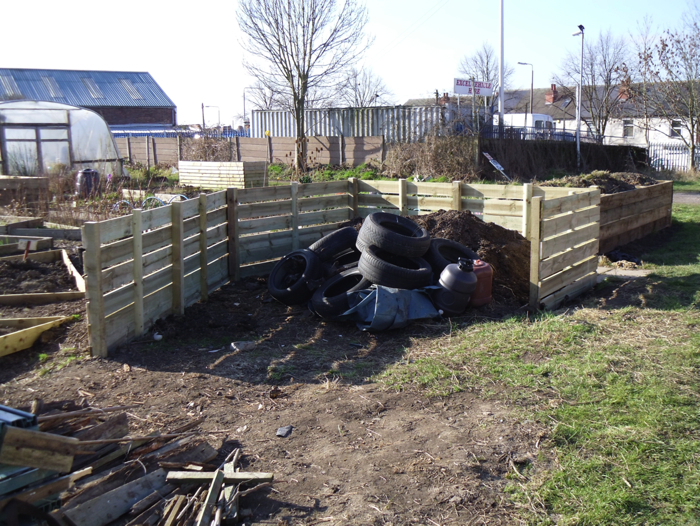 Pulp Friction also manage a dedicated fruit cage area on the allotment to supply ingredients for their wonderful smoothies. 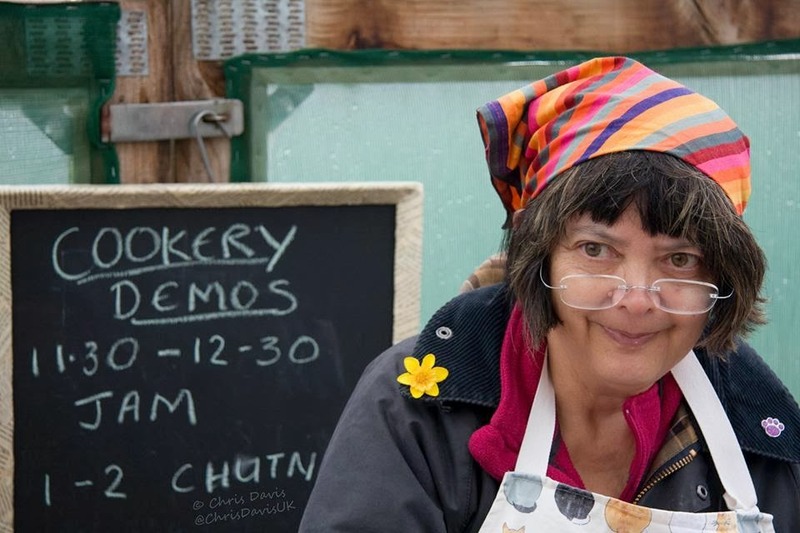 To cut a story short, on behalf of Dig In, I would like to congratulate Jill on receiving an award of £10,000 to support her Pulp Friction Travellin' Kitchen project after being crowned Britain’s Top Real Role Model by global direct selling company Amway UK. Well done Jill!! Social entrepreneur Jill Carter has been crowned Britain’s Top Real Role Model by global direct selling company Amway UK. Now in its second year, the campaign aimed to uncover the nation’s real role models and provide invaluable support for business start-ups, awarding £10,000 to the winner to help them begin their own social enterprise business. Jill will also receive mentoring sessions by judges and award-winning entrepreneurs, Jo Fairley and last year’s winner, Melanie Bryan OBE. Jill beat numerous entrants across the UK to the coveted title. Her proposed business idea, Pulp Friction Travellin’ Kitchen, is a social initiative which works alongside young adults with learning difficulties to run a mobile catering business that will operate at community events, farmers markets, parties, weddings and festivals throughout the UK. Alongside offering on the job training and personal support, the scheme will also deliver cookery classes for young people aged 14-19 using the ‘Let’s Get Cooking’ programme, supported by the Children’s Food Trust. Pulp Friction was originally set up as a youth project in 2009 to give young disabled adults the chance to develop independence, social and work readiness skills by running pedal-powered smoothie bars at different community events. This proved so popular that in January 2011, Jill took voluntary redundancy from her career to set up Pulp Friction as a social enterprise. 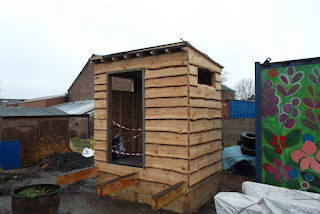 Many thanks to Helen for the latest eco-loo update photos. 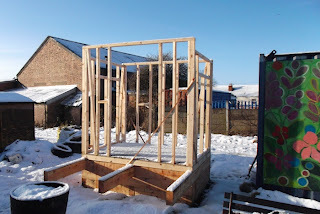 Significant progress has been made and I'm happy to report that we now have a roof, floor and four walls. Tim and James have also set aside some dates to involve Dig In volunteers with some of the construction and associated landscaping and we are all crossing our legs for completion and official opening of the facility in the next few weeks. Despite snow on the ground and cold feet, this year's pruning workshop event proved to be a great success. Event leader and freelance fruit tree specialist, Marc Richmond taught volunteers the ins and outs of pruning techniques, when to prune and how to maximise our fruit crops and maintain healthy trees by a regime of selective pruning and mulching. Attention was also given to the Dig In grape vine and the many varieties of fruit bushes in the Pulp Friction fruit cage. Thanks also go to Jill Carter from Pulp Friction for providing the wonderful homemade soups and pancakes which were eagerly enjoyed by everyone. Alan Withington from RCAN was also on site to present an official plaque to commemorate the construction of the Pulp Friction growing area and was in turn presented with a cheque for RCAN by the mayor. Alan Withington (RCAN) will also be running a construction course on the Dig In site in the near future, as well as helping us with other ongoing maintenance and construction projects. Recovering and repairs to the Dig In polytunnel are also planned for this year, so with the construction of the eco-loo, this is going to be a very big year for us in terms of site improvements for the benefit of existing volunteers and the community at large. With site facilities upgraded, we then intend to encourage and invite more elderly and disabled members of the local community to become involved with the Dig In project. 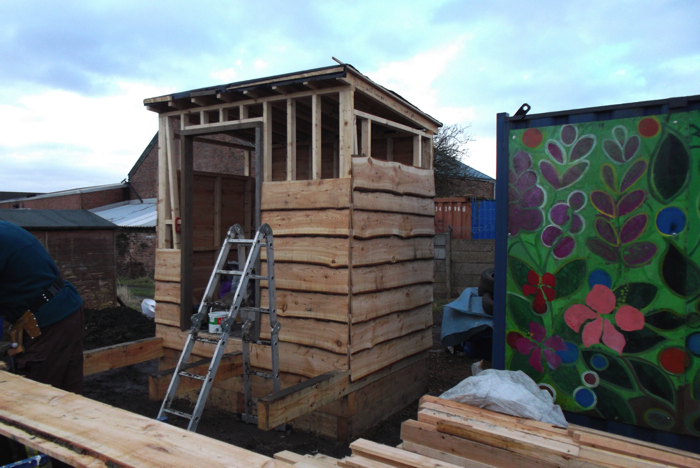 Tim and James have literally battled through the worst of our Winter weather with the result that the base and floor of the composting toilet have now been completed along with the framework to support the upper walls and door frame. 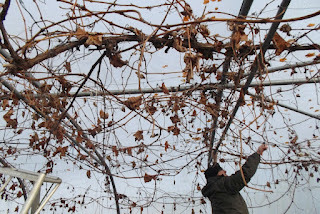 The photograph below (taken at the pruning workshop event) was kindly sent in by Helen. Yes, that is real snow on the ground and the temperature was as cold as it looks in the photo. 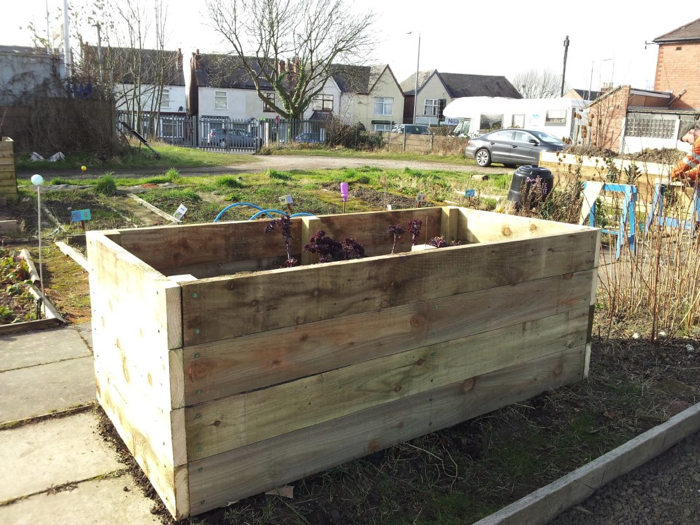 As part of Rural Community Action Nottinghamshire's 'Grow and Grow' project, Alan Withington will be hosting a 1 day workshop which will provide instruction and teach practical skills such as constructing raised beds, making planters, bee boxes etc. Please download the event poster for further details. The course will be held on Thursday 28th February 2013 at the Dig In community Allotment, Pasture Road, Stapleford, Nottingham [map] 9.15 for 9.30 am start. Finish around 2.30 pm. You will need to bring sturdy footwear, warm clothing, a waterproof in case of bad weather and a packed lunch. The course is free to organisations and individuals based in Broxtowe, but there is a £30 charge for those based outside the Borough (concessions apply). Booking for the event is essential. Work started on site this week to build the new Compost toilet. 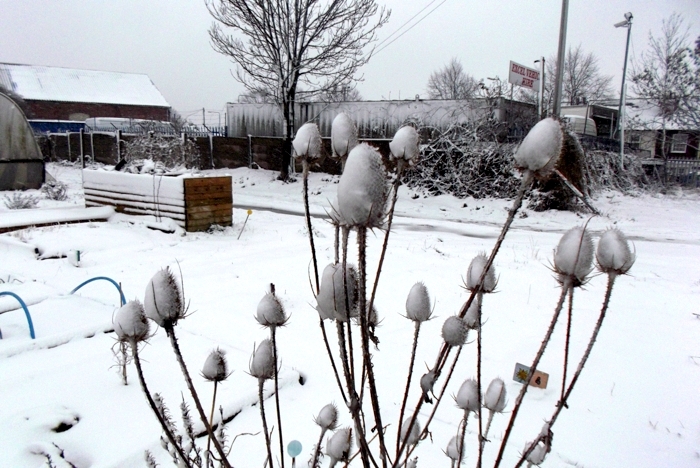 Despite the below zero temperatures and frozen ground, the foundations are already in place. Thanks to James and Tim for all their hard work. Dig In will be running a Pruning Workshop on Saturday 26th January, led by local fruit tree expert Marc Richardson. We will be pruning a range of fruit bushes including blackcurrants, gooseberries, grape vines and apple and pear trees. If you have a tree on site we might be able to help you prune it on the day. Pulp Friction are providing a hot lunch. The workshop is free of charge with a suggested donation of £10. Booking essential with Lauren on 07943700302.